May I share with you my biggest pet peeve? I can’t think of anything that ruffles my feathers more than someone who isn’t paying attention while I’m talking to them, particularly if that person is paying attention to their phone instead. Oh, let me tell you, it’s enough to make this red hair stand on end! I was raised with this odd set of standards called manners—a foreign term in today’s society. Manners dictate that when someone is speaking, you look them in the eye and pay attention even if what they’re talking about is not your favorite topic. You don’t have to agree with them. You don’t need to have something witty to say. You just need to give that person your undivided attention. Today, undivided attention is an oxymoron. With the rise of technology, we believe we can multi-task better than ever, but the truth is, we’re not multi-tasking. We’re just giving more tasks a portion of our effort and attention instead of focusing on one thing (or person) at a time. I’ve been in conversations with people who are scanning the room while I’m speaking. This gives me the impression they would rather talk with someone else, which makes me feel unwanted and unworthy. I’ve also been in conversations with those who pull out their phones and begin pushing buttons and flipping through apps while I’m speaking, making me feel less important than other things vying for their attention. Some, in trying to defend themselves, declare, “I was listening. I just needed to check this email.” But then, they ask me a question I had just answered, which confirmed what I already knew to be the case—they had turned me off the moment they turned the phone screen on. I think the reason this tops my pet peeve list is that it does so much more than anger me. It hits me where I’m the most vulnerable by making me feel unloved, unwanted, and unimportant. Like what I have to say isn’t valuable. Like my feelings don’t matter. Like who I am is not interesting enough to not be one-upped by a piece of technology. And, friends, I hate that feeling. After all, don’t we all long to feel loved and appreciated? Did you catch that? God wasn’t interested in sacrifices. He sought undivided attention. He desired praise and gratitude. Is that too much to ask? Is it that difficult to set aside some time to be alone with God? No phones. No television. No newspaper. Just me and God. Just you and God. No stray thoughts. No agendas. No to-do lists. Doesn’t He deserve at least that much? I wonder, too, if we gave God our undivided attention if that habit would transfer over into our interactions with our fellow human beings. What would our world be like if we would put aside our technology and agenda for a few minutes (or hours) and truly listen to one another? How many misunderstandings could be avoided? How many burdens could be shared? How much love and kindness could be related through the simple gift of attention? I don’t know about you, but I’d love to find out. Beginning today, I make it my goal to give God and others my undivided attention. I know it won’t be easy, and I’m sure I’ll mess up a few times (or more), but by God’s grace, I will learn to listen as He listens and to interact with Him and others with kindness and compassion. Who’s with me? I hope you don't mind if we take a short break from our series on confidence. It's been a wonderful learning experience for me, and I pray you, too, have gained insight from the various lessons we've studied so far. But today, the Lord has laid another topic on my heart, and I need to share it with you. A couple of weeks ago, we celebrated Easter, and generally, a part of the festivities include an Easter egg hunt for the kids (and, if we're honest, some of the adults). Even those of us who know and celebrate the true meaning of Easter love to see the joy on the faces of the little ones as they run through the grass, looking behind every bush and under each rock. Finding the eggs is fantastic, but the hunt itself is an exhilarating adventure, leaving us to wonder why we only do it once a year. What if I told you every day could be like an Easter egg hunt? Even better, what if this adventure was open to everyone, no matter their age, popularity or bank account? Life is like an Easter egg hunt, only instead of hunting eggs, we're hunting gifts. No, I'm not talking about paper-laden packages or boxes with bows. I'm referring to the many good things that pass us by each and every day without our ever noticing. I'm talking about the gifts we're too busy or preoccupied to notice. Let's face it, bad things are easy to spot. Annoying people or events are hard to miss. No matter how busy we are, we notice the negatives in life. For example, it didn't escape my notice that the noisy work trucks parked outside my house both yesterday and today before 8:00 in the morning. Their machinery and the voices of the men hollering at each other throughout the day were impossible to ignore. But, that's two mornings. How many quiet mornings pass by without me paying any attention? How many times do I take for granted the stillness of the morning? For whatever reason, it's in our nature to notice negative things and practically ignore the positive. But, what if we made an effort to find the gifts in each and every day? What if we explored the moments, aware and attentive of everything taking place around us? We might hear the lovely birdsong serenading our journey through life or feel the warmth of the sun as it shines on our face. We could find joy in the monotonous and happiness in the simple things like walking the dog or getting a shower. Imagine the gratitude that would well up within us if every day was an adventure to uncover gifts from the Lord. They're out there. We know they are. We just aren't looking. I don't know about you, but I love the idea of starting each day with joyful anticipation of what the moments may hold. I cherish the thought of smiling until my cheeks ache and praising God so much that my voice runs dry. I'm thrilled with the possibility of living each day in excitement rather than anxiety. And it's possible, my friends. Sure, we may get grass stains on our socks and dirt on our shoes, but what fun is it if we don't get a little dirty, right? Are you ready to leave behind the ho-hum? 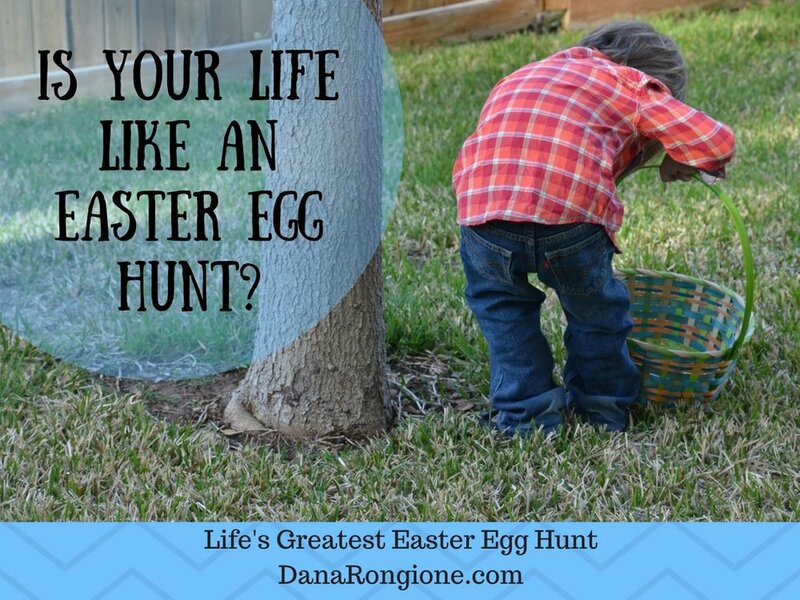 How do you feel about embarking on life's greatest Easter egg hunt? I love the idea, and I'm starting today. I hope you'll join me. After all, the more, the merrier!